Bodhi Wood | The Lion's Roar Echoing Through "Narnia"
The Lion's Roar Echoing Through "Narnia"
Singapore -- Of "The Chronicles of Narnia: The Lion, the Witch and the Wardrobe", probably the most intriguing feature of the blockbuster film is its magical host of myriad creatures, of both the ordinary and the mythological, all side by side. They range from humble beavers to ferocious leopards, homely fauns to majestic centuars. While unimaginative adults might find the idea of talking animals fantastically childish, well, why not? As long as they are depicted with compassion and wisdom, offering us universal lessons of humanity. So what if they are in reality unable to talk, or do not even exist? As long as they speak the truth! Throughout history, there have been countless fables with animals as the spokepersons of human morals. They range from Aesop's fables to the Jataka tales, which is a voluminous collection of more than five hundered stories narrated by the Buddha about his acts in his previous lives as a practising Bodhisattva - often as the leader of a community of animals. Just as Aslan the lion was the courageous kingly saviour of Narnia, the Buddha as a odhisattva, among been born as many other animals, also chose to be born as a fearless self-sacrificing lion - to lead and inspire other animals. Being the natural king of the jungle, he too commanded much awe and respect. Incidentally, the Buddha was also called the "lion of men". The Buddha's spoken teachings are also described as "the lion's roar" - for they are far-reaching, with the great ability to command authority and respect. Most of all,the truth they convey have the earth-shaking ability to radically transform the listener. Being a Christian-inspired tale by C.S. Lewis, Aslan vaguely symbolised Jesus, who is believed by many to had resurrected through the power of his virtue to save the masses. In Buddhism, there is resurrection of another kind - through rebirth. Great heroic Bodhisattvas, beings who aspire to perfect their compassion and wisdom through service to all beings, are able to willingly choose to be "resurrected" for innumerable times, for as long as it takes, to aid other beings on the path to enlightenment. With unsurpassable skilful means, they can appear in the guise of animals or other forms. Though they may ultimately relinquish their lives to save others, they never fail to return in a future life better prepared - with the greater spiritual power of accumulated merits and the wisdom of experience. No, the great Bodhisattvas, the greatest being the Buddhas, who are perfected Bodhisattvas, do not only "die" once for the welfare of others. More significantly, they live countless full lives to benefit all beings great and small. This truly, is the greatest, most selfless sacrifice possible! What's more, there are always Bodhisattvas hard at work, doing their best in each moment to enlighten all! The onus to awaken then, lies on us! The film focuses heavily on the idea of prophecy and destiny - on how the four protagonist children were predicted sons and daughters of the biblical Adam and Eve who will save Narnia. The bewilderment of their foretold destiny reminds us of nominal Buddhists' suspension of belief when given the "good news" that we were all prophecised by the Buddha to eventually become fully enlightened Buddhas like himself - as long as we put in the right effort to actualise the potential of our Buddha-nature. Yes, we can all become perfect, and we can all do our best to "save the day" as Bodhisattvas do. In this sense, this ultimate prophecy of our Buddhahood is open-ended, fixed, yet not fixed, up to us to fulfill - though the enlightened are ever ready to guide us. Are we really children of Adam and Eve, the biblical first humans? According to Buddhism, we are descendents of no one in particular - as we are the karmic descendents of ourselves from our previous lives. We do not inherit the sins of "the father", for we are the heirs of our own karma, born of our own karma. It is also karma that binds us as family with similar behavioural tendencies, since "birds of a feather flock together". Yes, no poor genes were ever passed down to us by our parents - similar genes simply "flock together" in the interplay of collective karma! We are then fully responsible for the way we turned out to be and what we will become! 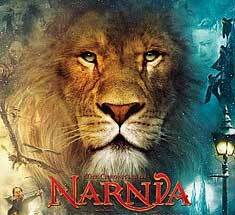 Forgoing the typical Hollywood razzle-dazzle of the film, the original Narnia chronicles reflect the author's belief that the Earth, its animals and humans could live a more harmonious co-existence. He strongly believed that as long as humans do not care and appreciate animals, who are supposedly already "lesser" creatures, we are unlikely to be likewise caring and appreciative towards fellow humans. In his words, "In justifying cruelty to animals, we put ourselves also on the animal level." He also uttered that, "If we cut up beasts simply because they cannot prevent us and because we are backing our own side in the struggle for existence, it is only logical to cut up imbeciles, criminals, enemies, or capitalists for the same reasons." Though Christian, one almost suspects the late Lewis to be a "Bodhisattva" in some sense, as a champion for the animal kingdom. Ironically, he did not think much of the value of vegetarianism, which is a cherished Buddhist ideal as a means of living a more harmless life. Truly ironical indeed, for while he imaginatively bestowed animals with the power of human speech, he probably did not envision what his animals would have to say on being reared, killed and eaten by humans, including himself. Looks like, Lewis, like the most of us, with our imperfect compassion and wisdom, can all be better Bodhisattvas!